Water bottling line combiblock consists of blowing unit, filling unit, and capping unit. With the synthetic application of electricity, mechanics, and pneumatics, and synchro controlled by servo system, Combi is applicable for the integrated control of several equipment and the whole production process. It doesn't need empty bottle conveyor and rinsing part of the traditional filling machine, which saves a lot of room for the production plant, reduces water consumption from rinsing and energy consumption from fans usedon empty bottle conveyor. It cuts a majority part of transit and guarantees the overall hygiene standard of the entire machine, whichbetter helps end users increasing the overall production efficiency, lowering investment costs, saving energy consumption and maintenance costs. It adopts the matured worldwide-standardized way of preform feed-in and unscrambling, in which preforms go through preform elevator and are transmitted to preform unscrambler. Inside the preform unscrambler, preforms are automatically sorted and delivered by two inclined revolving cylinders with same speed, and the remaining ones will be picked by star wheel and sent back to preform hopper. The whole process of preform unscrambling is fully automatic and has high efficiency without preform scratches. There are six infrared heating tubes adopting the best heating technic with bottleneck underneath. It reduces heat going upwards which damages bottleneck. At the heating area, there are finely designed air flow technics, cooling water tunnel for bottle neck, and air cooling protection device, which provide thorough protection to bottle neck. Heating tube temperature and preform temperature are transferred to PLC through oven temperature sensor and infrared thermodetector, and the actual temperature can be displayed and set at computer screen. By using PID function, each layer of heating tube power can be adjusted in order to achieve the best heating temperature curve for the preform. The new designed modular heating oven adopted structural advantages from different overseas manufacturers, and installed specially designed extra-long short wave infrared heating tube for the optimization of spectral wavelength and reflectance coating. It increased reflection efficiency, and heating oven becomes more energy-saving, also more convenient for installation and maintenance. Optimizing and adjusting air flow of the heating area increases heating stability. Moreover, the unique three-way air tunnel cools the preform body, bottle neck and preform holder with different amount of cooling air, which effectively protects bottle neck damages. Special manipulator delivers heated preforms to moulds along certain cam curve. After stretch pre-blow, the preform will be blown to bottles by connecting high pressure compressed air. Special manipulator sends the finished bottle out along certain cam curve. The blow-made bottles are transported to filler via starwheel. After entering filler, the bottle is held by gripper of lifting cylinder and realizes up and down under effect of cam. The filler adopts gravity filling way. Bottle mouth rises to open filling valves and start filling. While product rises and plugs up air return hole, the filling will be finished. After filling, bottle mouth moves down and leaves the filling valve. Bottles enter capper via transition starwheel. The anti-rotation knife of capper blocks bottle neck to keep bottle vertical and prevent rotation. Capping heads keep revolution and do rotation. Under effect of cam, the action of gripping cap, sleeve cap, screwing cap and discharging cap to finish the whole capping course. 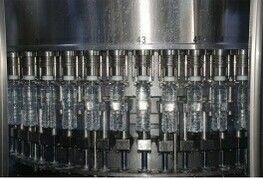 The finished bottles are conveyed via bottle-out starwheel onto bottle-out conveyor, and then are sent out of the combiblock. The whole machine adopts console sealing windows, beautiful and decent. 1) Special designed secondary blowing system monitors in time pressure curve of bottle stretch process in each cavity to provide accurate and timely parameters for technical adjustment, which is more convenient for operators to adjust technical parameters. 2) Adopt manipulator transfer technology that cam mechanism has precise control. Catch and send preforms at high speed and the quality is reliable. Taking preform, sending preform, taking bottle and sending bottle match action of opening and closing mould to ensure that the movement process is exact and high efficient. Taking preform, sending preform, taking bottle and ranking bottle are finished automatically by manipulator, avoiding middle pollution. 3) The cam mechanism controls exactly opening and closing of mould frame. Special mould locking and pressurizing system and simple and firm mould frame structure can control independently the blowing parameters of each cavity. Good malfunction diagnosis function and special blowing structure ensure the sealing reliability under various pressure. The blowing pressure can be adjusted. 4) Stretch rod control exactly preform's axial stretch. The first blow and second blow control preform's vertical stretch. By precise adjustment of the first and second blow, the ideal distribution of bottle wall thickness can be achieved. 5) Break conventional design and adopt structure of coaxial rotary bushing with small cubage and light weight. Adopt two deep groove ball bearings to fix two ends to make outside sleeve and core axes concentric, to ensure that the rotary sealing ring is not easy to be damaged. At the same time, increase one water back channel to make the leakage water in Gore circle flows back along pipe, ensuring that the water distributor won't have leakage. 6) Heater adopts extend 6-section short wave infrared ray temperature control. Pre-heating zone and adjusting zone's lamps can be controlled and adjusted respectively by technical requirement. Equip real-time temperature monitoring system to ensure stable and accurate process. 7) Cooling water channel and preform cooling system effectively protect the bottle moth and avoid high temperature occurring in outside wall of the preform. Our company's heating system can save energy 20% compare with other suppliers. 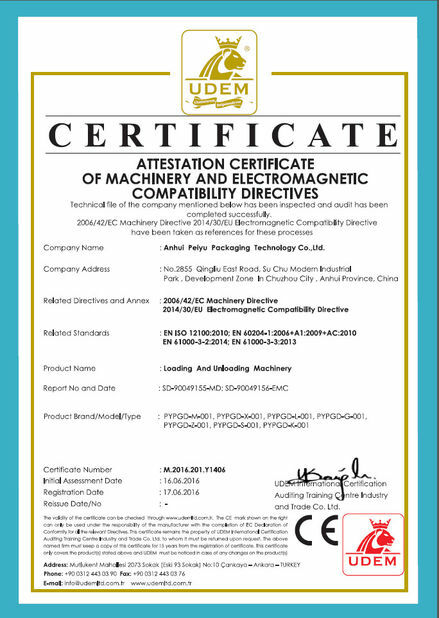 8) Pneumatic line parts increase exhaust recycle system (according to customer's requirement) can save air 30%-50% to save energy consumption and reduce cost. 9) Parameters of heating temperature and blowing time can be set according to different preform and bottle shapes. While changing bottle shape, user only needs to call the pre-set parameters. 10) Adopt German lubrication system to do automatic lubrication for the machine so that the machine can get enough maintenance and the reduce worker's work. 11) Mould installation is easy and simple and it can be changed in shortest time (within 2 hours). 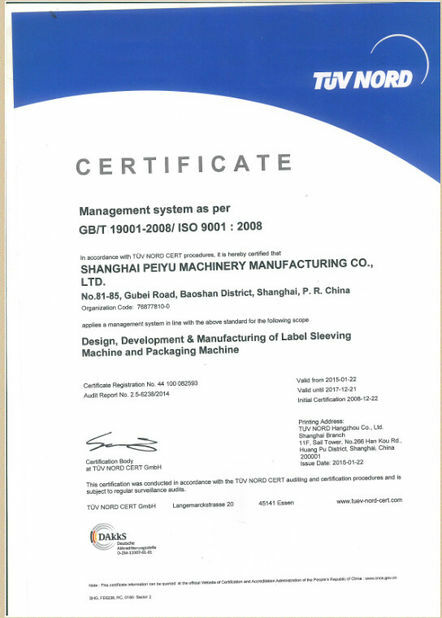 The Stop time of production is reduced which is helpful to improve production efficiency. 12) Humanization design makes complicated industrial operation close to people's habits. High-resoon HMI and multi-languages option adapt to users from different area. 13) Real-time monitoring function and various malfunction alarm hints and help, flexible and convenient parameter set can satisfy various technical requirements. 15) According to customer's requirement, the whole system can be maintained by Ethernet. 16) The mould is made of special aluminum alloy. The surface adopts special hardening process to extend the mould life and lower the production cost. 17) Preform infeed starwheel equipped with perform stuck inspection system. In case the preforms get stuck, the unqualified perform will be rejected automatically. After the unqualified preform get out of the equipment, this system will self-reset.